As Asian American film scholar Celine Parreñas Shimizu notes, there is “a long tradition in Hollywood movies of iconic portrayals of Asian American men (as) rapacious and brutal, pedophiliac, criminal, treacherous and also romantic, and quaint. Sexuality and gender act as forces in the racialization of Asian American men.” Sadly, despite tiny steps towards improvement, Asian male representation in Hollywood still remains timidly entrenched in stereotypes. Sure, John Cho is the leading man in Selfie, (although he’s already starting to be a bit stalkerish), and Glenn (Steven Yeun) from The Walking Dead is still alive and human (though there are persistent rumors of his imminent demise), but on the big screen the ridiculously hot Lee Byung-Hun is still playing the bad guy (most recently in the upcoming Terminator: Genisys) instead of fulfilling all of our fantasies as a romantic lead. Strangely enough, our modern era is in some ways more regressive than, say, 1959. Althought the 1950s weren’t known for their progressive portrayals of Asian Americans in Western films, in that year Asian men appeared as objects of desire in two significant movies. In 1959 the Hawai’ian born Sansei actor James Shigeta made his big-screen debut in Sam Fuller’s film The Crimson Kimono, playing a Los Angeles detective assigned to the case of a murder of an exotic dancer. The film is an engaging cop movie but it’s most notable for its portrayal of a love triangle involving Shigeta, his white partner Sgt. Charlie Bancroft, and Bancroft’s girlfriend Christina, who is also white. Unlike most such romantic conflicts involving an Asian man opposite a white guy, in this case Shigeta got the girl, which made The Crimson Kimono a groundbreaking anomaly in Hollywood. James Shigeta was a co-winner of the 1960 Golden Globe Award for Most Promising Male Newcomer and he would go on to a moderately successful career as a romantic lead for a few years but he never became the superstar that his good looks and charisma would indicate. Like most Asian American men in Hollywood up until and after that time Shigeta ran into the impenetrable glass ceiling of racism. 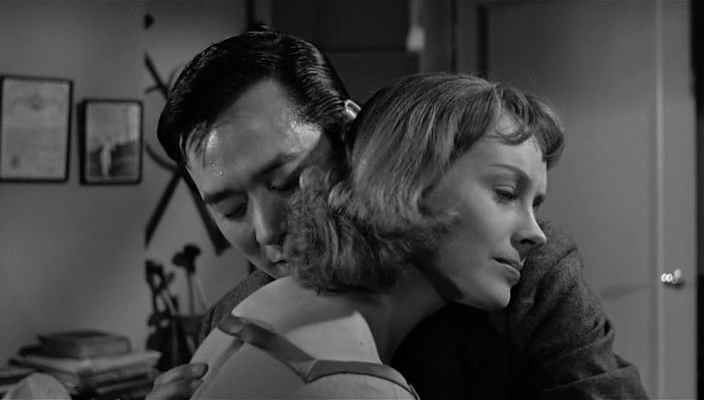 1959 also saw the depiction of another desirable Asian male, in Alain Resnais’ Hiroshima Mon Amour. In that film Eiji Okada plays the intensely romantic Lui, a Japanese architect who has a brief and torrid affair with a Frenchwoman played by Emmanuelle Riva (seen most recently in Michael Haneke’s Amour). With a screenplay by noted Asiaphile Marguerite Duras (L’Amant/The Lover; Un barrage contre le Pacifique/The Sea Wall), Resnais’ film depicts Lui as suave, tender, and desirable, which contrasts greatly with the ways that Hollywood has typically portrayed Asian men. Okada is particularly swoonworthy as he and Riva’s character passionately discuss love, war, genocide, and beauty, against the backdrop of the site of first the atomic bomb attack. With the ruins of Genbaku Dome in the background, the film also utilizes a nonlinear narrative structure that links the European front, as exemplified by a long flashback set in France, to the Pacific theater, with Hiroshima repping for all of Japan. Set some fifteen years after the end of World War II, the film emphasizes the human cost of the war even many years after its ceasefire, as both Lui and Elle have been scarred by the loss of loved ones in the conflict. Elle fetishizes both her late German lover and Lui, as she is drawn to them due to their difference and otherness. 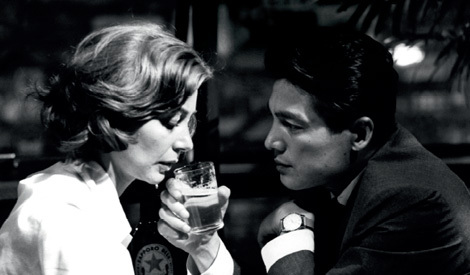 Now releasing theatrically for the first time in years in a new 4K digital restoration, Hiroshima Mon Amour remains fresh and relevant both thematically and stylistically (it’s regarded as one of the most influential films of the early Nouvelle Vague, or the French New Wave). It’s also an example of an early representation of an Asian male as not a caricature, a villain, or a clown, but as a fully fleshed out, highly desirable romantic lead. Now if only Hollywood could get a clue and do the same in the 21st century.